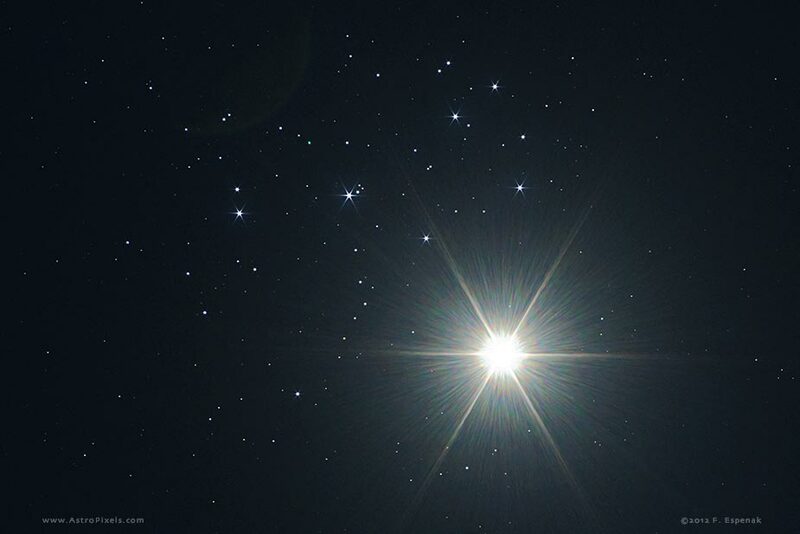 Venus and the Pleiades star cluster, April 6, 2012. Shortly after the Sun enters Capricorn on the day of winter solstice (here in the northern portion of the globe), the planet Venus turns retrograde. You may have noticed her brightness and captivating beauty gracing the night sky just after sunset. She’s hard to miss. Venus is always at her brightest a little over one month before she conjoins the Sun. One look at her stunning visual brilliance and it’s certainly no surprise the ancients named her in honor of the goddess of beauty and desire. For those so attuned to the magical and energetic pulsations of the cosmos, one glance at Venus creates a slight tug on your heart chakra. Venus has a powerful magnetic appeal and resonance. Aside from her obvious visual beauty in the heavens, her cycle around the Sun, from our geocentric perspective, is mind boggling in its precision, perfection and accuracy. Venus’ synodic cycle forms a near perfect rose shaped pattern. And within this perfectly symmetrical natural formation lies a stunning pentagram--each end formed by her retrograde stations that alternate between five zodiac signs. The cycle of Venus moves to a very predictable rhythm and beat, with her retrogrades occurring in approximately the same location (within 2 or 3 degrees) every eight years. This knowledge alone explains her archetypal affinity with aesthetic beauty, symmetry, homeostasis and equilibrium. These qualities are embedded and etched into her cyclic structure. As Venus travels through the great firmament, she weaves a beautifully intricate web that interconnects various timelines. She weaves our fate, so you could say, and when Venus turns retrograde many “fated” encounters begin to emerge from the shadows of time. The same could be said of a Mars retrograde cycle too (which will begin in March of 2014). New people, or creatures, with a familiar vibe suddenly emerge. Have we met them before? Perhaps from another life—perhaps a long time ago in another dimensional plane of existence, or another planet, maybe. That sense of familiarity is important, and it’s all that matters. From that point on you know: there’s some important business to settle, some desire to exhaust fully. If not now, then maybe later, maybe next retrograde. If not, we’ll meet again, that is, until we feel complete with this whole crazy trip. Venus is magnetic and attractive. These connections reemerge because of this attractive force field inherent to the psyche. This whole matrix, this web of Maya, the illusion, it’s enticing. It draws us in; it draws us deeper. We associate Venus with Libra and Taurus, which reveals some level of deeper understanding. Libra is all about making associations (between people, objects, concepts, creatures and constructs), building bridges, and maintaining balance and homeostasis. When Venus turns retrograde, we must re-connect bridges we may have burned but regretted. We must balance the scales in some way. We turn our gaze backward; our “karma” attracts some “unfinished business” with a particular association or experience our soul (or maybe ego) felt was incomplete, unresolved or unfulfilled. Something deeply fateful begins or comes to conclusion. Either way, the pain, the joy, or the indifference is curiously familiar. It’s all happened before. This is a familiar crossroads. There was a lesson we didn’t learn, and now we get a chance to see it. Taurus is all about the moment—the beauty of the here and now. Taurus also deals with personal values, our sense of self-worth, and what we accumulate that makes us feel valuable. That equates to physical objects, ideas, beliefs, people or places. When Venus turns retrograde, as with all retrogrades, we must reassess some things. With Venus one keyword is reevaluation. Our value system gets scrutinized, by ourselves or by others. Our relationships reveal shadows and blind-spots we usually push aside to keep the peace or to maintain a veneer of social grace or politeness. A Venus retrograde can bring about a reevaluation of issues of dependency, self-sufficiency and emotional communication within relationships. Whether her dark side or light side emerges, something shifts, something changes. Values are called into question, as well as the personal sense of feeling valuable, lovable and worthy. Venus will be doing a sort of tango with Pluto. As she turns stationary retrograde, in Capricorn, she slowly makes her way back to conjoin Pluto and fire up the “sign of the times”, the Uranus and Pluto square. That’s pretty significant. But probably not worrisome like the upcoming t-square with Mars retrograde in April. I’ll get to that later (in another article). Venus, even when retrograde and revealing her more “unsavory” or shadowy side, has a calming and rejuvenating nature. Venus is more aesthetically, artistically and peacefully inclined. Coming into contact with the Uranus and Pluto square could set off some truly remarkable and “out of the box” artistic, scientific and philosophical creations. This retrograde cycle can be incredibly useful because it helps to create or reevaluate strategies to effectively and precisely break free of controlling or stifling circumstances. The seriousness and focus of Capricorn lends well to getting to the bottom line, dealing honestly and authentically with things we don’t usually see, and very efficiently dealing with unresolved and deeply embedded karmic issues. I would imagine this cycle in Capricorn will direct our attention to tremendously stifling material that’s inhibiting forward growth and the ability to direct one’s own life they want to; or preventing the collective energy from moving forward in more positive creative directions. Radar image of the surface of Venus. Photo by NASA via Wikimedia Commons. Venus retrograde in Capricorn is about changing and reevaluating priorities, ambitions and social roles. Use this time to seriously examine all the things you give the most attention, time and energy toward. Look intentionally into the dynamics of your relationships and the people currently in your life. In addition to her conjunction with Pluto, Venus will oppose Jupiter in Cancer. The past and the future are at odds here. A desire to mature, grow up and restructure our lives finds a strong counter desire to remain in the past, to keep from rocking the boat. And because the past hits us like a tidal wave of nostalgia via all this retrograde madness (just beginning, mind you), we may feel that sense of paralyzing immobility. But while Venus is retrograde, we must keep in mind that this is a natural time of reflection and reassessment. The ghosts of the past come out to bring us messages and reveal lessons. This is a highly growth oriented cycle. At the heart of Capricorn is a profound need for solitude and inner validation. Capricorn requires time alone to deeply reflect and rejuvenate its soul. This may be more of a time for intimacy with oneself, to practically restructure personal goals, relationship needs, and inherent values. This may also be a time of sorting through or processing painful emotional material. With the presence of Pluto in the sign of Capricorn, this is a cycle that deeply emphasizes letting go and allowing those decaying elements to leave our experience. This may be a time to sever connections with rotting attachments we are afraid to let go of. With Venus turning backwards, there may be a profound change of heart. There may be a need to face deeply embedded fears and realities that are holding us back. Whatever happens, Capricorn, and its ruler Saturn, teach us about trust. Can we trust the process at hand? Can we trust that letting go will eventually lead to something new and rewarding? The last time that Venus was retrograde in Capricorn was Dec 2005-Feb 2006. You are likely to find yourself dealing with similar themes and issues from that cycle. All cardinal signs will be the most impacted by this retrograde process: Aries, Cancer, Libra and Capricorn. Significant planets or placements in any these signs, such as the Sun, Moon or Ascendant—and to a lesser extent Mercury, Venus or Mars—will respond most strongly to this particular retrograde. Venus turns stationary retrograde at 28 degrees of Capricorn and 57 minutes, and will turn stationary direct at 13 degrees of Capricon and 34 minutes, closely conjunct Pluto. The 28 th-29 th degrees of any sign are highly sensitive points. They tend to indicate a critical process of culmination, or events with an explosive quality or symbolism. Venus entered the shadow of her retrograde on Nov 20, 2013. Venus will turn retrograde on Dec 21, 2013, the day of the solstice transition, when the Sun enters Capricorn. Venus turns direct Jan 31, 2013 and will leave the shadow on March 5, 2013, just after Mars turns retrograde. The Venus/Sun inferior conjunction takes place on Jan 11, 2014, sextile Saturn in Scorpio.